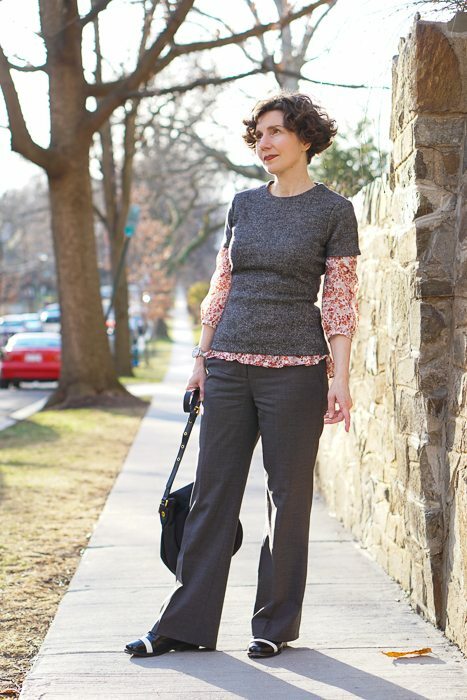 In part of its Continuing Education series on seasonal transitions, The Directrice presents more ideas about dressing for early spring. wear spring clothes, but add a large scarf made of linen or silk for warmth. Could I wear the floral voile blouse with a tweed top? 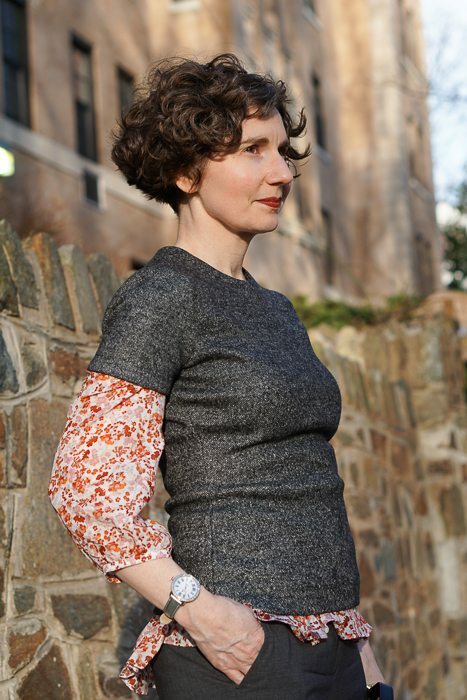 You’ve sort of seen this wool top before; I showed the same top in a different color last week. This top is actually fabricated from the same fabric as the other one; this is the reverse side. That’s a fact about double-knits. The obverse and reverse are both fully finished fabrics. Nota bene: It is in moments like this that I realize The Directrice needs an intern. Someone should have tugged the hem of this top down, or at least told me to do so. But you understand that I am an amateur, right? The blouse? She is new, for spring! The many pinks in this pretty floral called out to me through the store window when I was walking by Anthropologie. 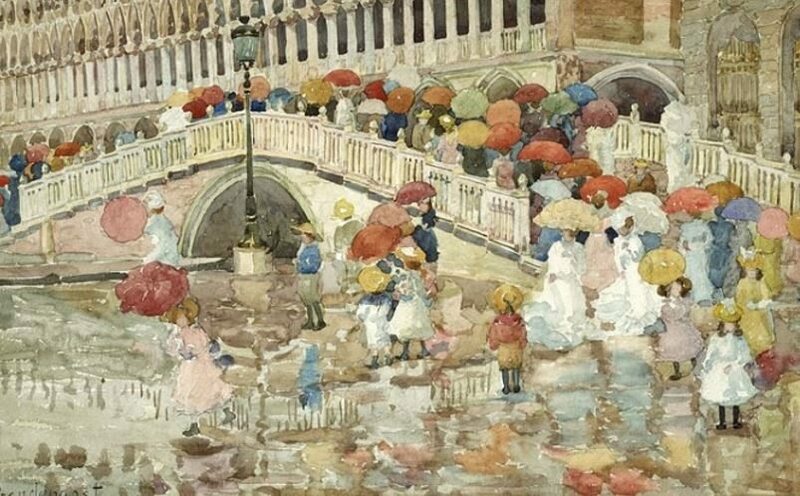 The pattern reminds me of Maurice Prendergast’s watercolor, Umbrellas in the Rain. I bought the blouse thinking I would wear it with a khaki jacket and dark rinse jeans. But I happened to lay it down on top of this tweedy top while gathering hangers to put things away in the closet and BLAMMO I was struck by how pretty the two looked together. 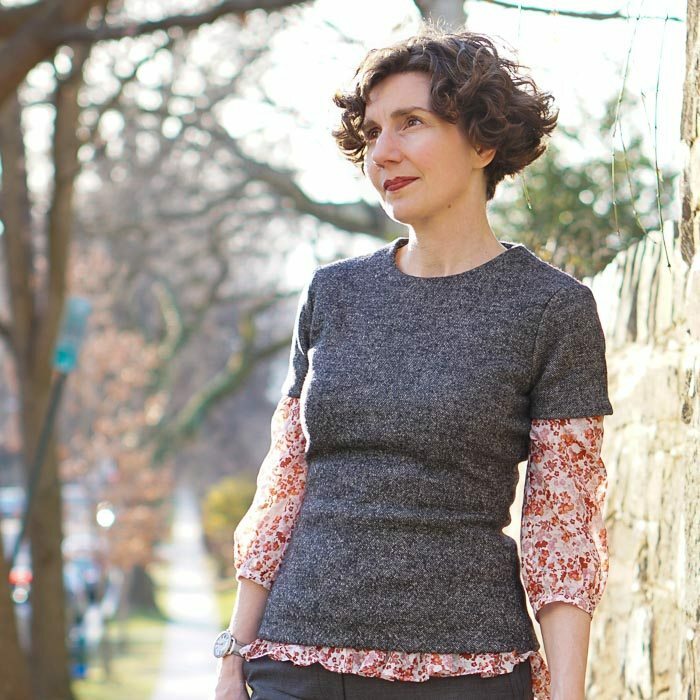 The blouse is a cotton-silk blend, which means that it is very light, a little crisp (but not stiff),and washable at home. The blouse is longer in the back than the front. I think this creates a charming silhouette, though some might think that the Directrice has a tail. Beware: The blouse is very snug through the bust and midriff. All the reviews advise going up 1 or 2 sizes, which I did do. To finish things off: black shoes with a dash of white and a black nylon cross-body bag. The Photographer wants an intern, too. Someone to hold his camera equipment. Lovely layering just like on Friday’s post! Whammo, blammo – looks fantastic! As always, v impressed with your outfit building skills. And sure, you could have pulled the sweater down, so it was perfectly flat against your body, but hey, we’re all living in the real and now, and once we start moving, so does our clothes! So really you could say, you are showing your blog as a reality series!! Is your creative style appreciated at your job? Do the other lawyers take note of your outfits? Do you get positive feedback? Sometimes! But there are a lot of stylish women in my office, so I don’t think I stand out. My co-workers love my blog (at least, some of them do) and they have been so kind and supportive of my creative endeavors herein. This is a very sweet outfit and I have lots of silk blouses I can try this with, but will have to dig out my wool/thicker fabric type tops to see what might be able to go on top. We’re just finishing summer here in Australia, so all wooly things are packed away right now. Looking forward to new outfits when it gets cooler here. Ps I’d LOVE to be your intern. Pps I see your white stripe boot caps there. They are great boots. I am preparing your paperwork for an H-1B visa now! A great combo! Reminds me to do more short sleeve / long sleeve layering, especially in this seasonal transition time. 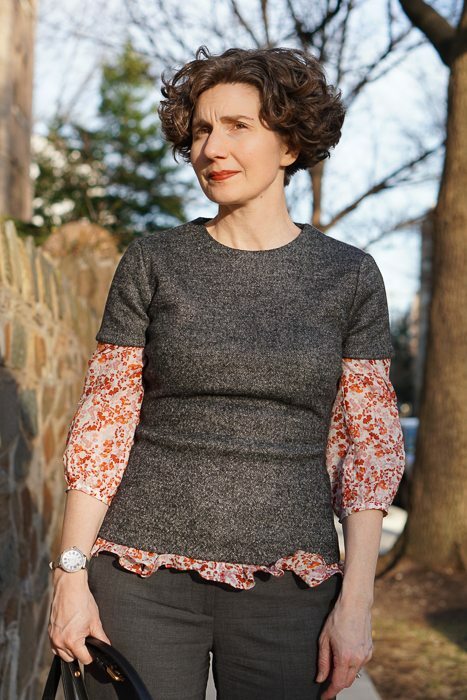 Nice take on the “art of layering” and speaking of art – Maurice Prendergast is one of my favorite American artist – now I must have this shirt!